Woolloongabba has continued to surprise and outshine other trendier inner city suburbs in the last few years partly because of its burgeoning café culture. It seems that new cafes and coffee pit stops are opening up every couple of months amongst the auto workshops and industrial buildings. 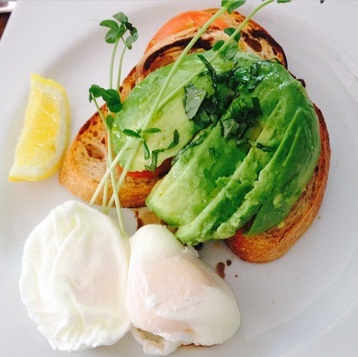 The Gabba might not be as pretty as New Farm or Paddington, but if you're after looking to start the day off with a bang, it's got an eclectic selection of cafes, each with interest and exciting breakfast offerings. After working in the suburb and living in neighbouring East Brisbane, I've been lucky enough to try several over the last year. Here are 5 of the best ranked in order from five (very good) to one (1 being a must do Brisbane breakfast stop). As I'm sure most people will attest to, not every café is good on every day, and despite some less than stellar service, and some average menu items either experienced myself on a visit, or from comments made by people I breakfasted with, all of these breaky spots I've visited more than once. This alone means they've fit the criteria of being good enough to go back to which is no mean feat with so many good cafes in Brisbane and so many reviews of new places that want to write. Combine that with the fact I'm a weekend breakfast fiend. I've ranked them from 5-1. Number 5 being very good, to 1 being up there with the best of the best cafes in the whole city, with each being ranked based on their atmosphere, food and service. 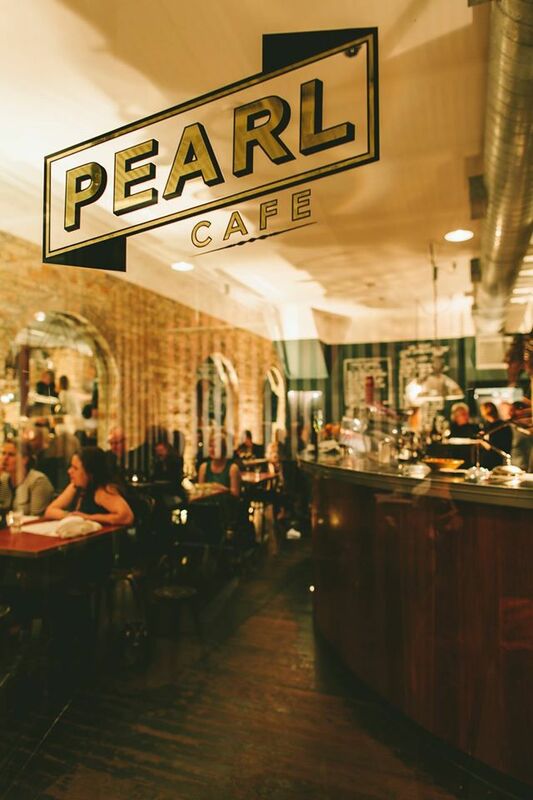 Located in what I like to call the 'posh part of the Gabba' on Logan Road, Pearl Café is a dimly lit refuge away from neighbouring bistros, restaurants and antique showrooms. Pearl is an atmospheric venue, and slightly French. Additionally it's exposed brick wall and wine bar upstairs make this a décor delight. Don't expect the usual breakfast offerings though – this is more of a full flavoured brunch spot with richer and full flavoured options which could be hard to stomach early on in the day. The menu constantly changes with the season, but I've had the gruyere bread and toastie, and despite being one of the 'safer' options on the menu it was still adventurously different to any toasted 'ham and cheese sandwich' I've ever had. For something a little sweeter, I can also highly attest to the simplicity and charm of the winter fruits with buffalo yoghurt, persimmon, apple and cumquats. I haven't found the staff to be overly warm though or particularly accomodating, but with an unusual and creative range of ingredients and changing menu, this is a venue serving up good food that staff are no doubt pretty used to being complimented on. With an ambience something akin to an old world bar you'd find in Paris or Dublin chances are that you probably won't care too much about the 'take-it-or-leave it' service either. The team behind Moose and Gibson (named after the owner's two dogs) are also behind some of Brisbane's most exciting new venues, and have recently opened up Habitat Restaurant and Bar in West End – combining the Aussie love of a causal bar, craft beer and a relaxed restaurant environment. Moose and Gibson is their second venture after Tarragindi's Leaf Espresso and is located on Jurgens Street, (the street running parallel to Ipswich Road behind the car dealerships and the Clem 7 tunnel ventilation building). 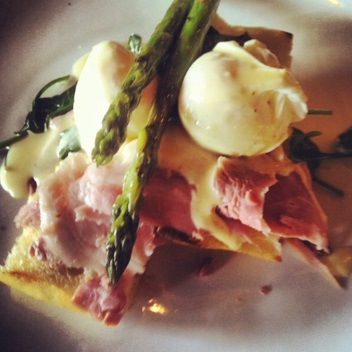 I've had the Quark Eggs, with asparagus, leg ham, and a subtle cheesy finishing sauce that in my opinion wins over gluggy hollandaise any day. They also do a mean (and by mean I mean nice) baked eggs (shakshuka) which could be the perfect antidote for a rough night and a hearty, nourishing choice. Service is quick and seating is cosy and borderline cramped depending where you are seated, but the welcoming staff and great coffee make this one café where you could easily see yourself becoming a regular – for a takeaway coffee fix at the very least. The Quark Eggs at Moose and Gibson is a savoury breakfast savior! If every bakery was as good as this in Australia, I'd be convinced instead of walking we'd all be waddling. For those after a proper sit down breakfast or brunch don't let the fact that this is a bakery put you off – it's not the type where you pick up a loaf of bread or sausage roll and the Bakers Arms is so much more than a suburban café with crumb seeking pigeons hovering out the front. 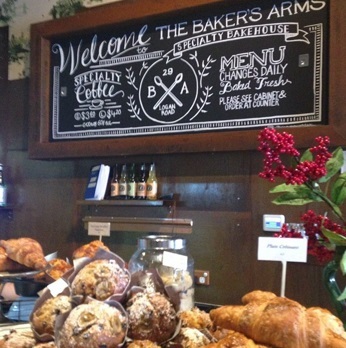 The Baker's Arms have no set menu because everything is baked fresh daily, and you can count on savoury tarts and quiches, omelettes, as well as wraps, salads and gourmet sandwiches. You'll be able to see straight into the bakehouse work area where you can see the bakers at work in what is a very noble profession indeed for which their toils make a lot of people VERY happy. Get excited about exotic ancient grains which are definitely making a comeback among the health conscious hipster crowd including spelt, quinoa and buckwheat which regularly feature in both savoury and sweet treats. Speaking of hipster, the 70s style suitcase and rustic print wallpaper, and hessian sack feature wall ensure you feel trendier and fashion forward (or backward depending who you ask) just by stepping inside. With highly acclaimed Campos coffee, not to mention some excellent (albeit quite expensive at $7.00) cold pressed juices – Mint and Watermelon is a must have, this is a relaxed, welcoming and well run operation. Be sure to stop in, and stop in again, to sample their ever-changing cabinet of goodies. Breakfasts and brunch by day, and wine bar with sangria and live music in the evenings. Yes please! The Foxy Bean may not be one of the newest kids on the block in the Woolloongabba Café scene, but has been occupying a well worn street corner on Potts and Stanley Street. 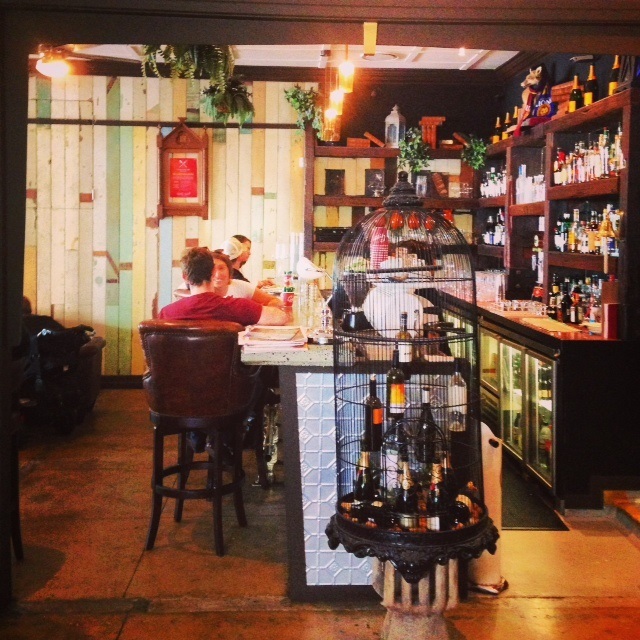 What welcomes is a funky and shall I say a foxy little venue which turns into a Wine Bar in the evenings with Live music on Sundays complete with Sangria to whet your whistle. However for breakfast time, this place is a completely enlivening affair. Brewing Genovese coffee, I can recommend the Hello Haloumi for those wanting to go for an egg free brekky (sometimes I just can't stomach eggs straight up). Including a right mix of condiments and mushroom, watercress, haloumi, tomato and herb salsa and smashed avocado on sourdough, this in my opinion is not to be overlooked on the menu. This place gets pretty packed on a weekend so arrive early and if you're lucky you'll be seated out in the open air courtyard. I've been here 4 times now and have also enjoyed the Eggs benny ( get it with salmon if your a fish lover) and the Chorizo breakfast with mushrooms and poached eggs, which is sadly no longer on the menu. The service is breezy and no nonsense albeit friendly, the wait times good and the kitchen consistently churns out good quality and well-presented meals. With their bar area, and spacious covered outdoor courtyard – there is a lot more than meets the eye as you step through the signature red doors. 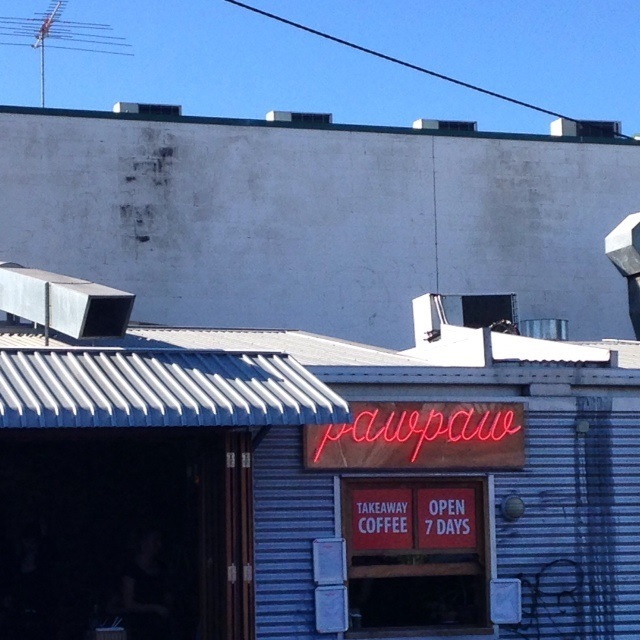 My favourite breakfast spot in Woolloongabba has to go to the Paw Paw Café, directly across the street from Foxy Bean. Inside welcomes you with a venue which also offers Asian inspired cooking classes. At the front of the Paw Paw café is the Green Papaya, which is worth a visit at dinner time, offering Balinese and Thai fusion foods. Their tropically inspired breakfast menu offers breakfast with a difference and includes many vegetables, fruits and a slightly Central American beachy feel about it, partly because of the breakfast burrito and other tortilla dishes on the menu, fresh juices and the paw-paw palm wall paper. 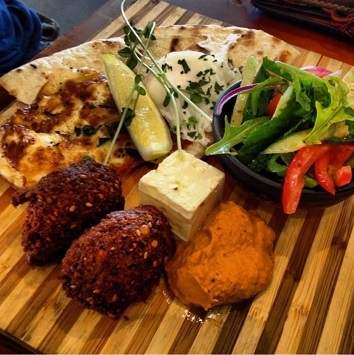 The Corn Fritters are a must-have, as well as the Braised Mushroom Bruschetta and my personal favourite is the Israeli breakfast board which comes complete with dukkah, haloumi and felafel. If you are looking for something less than the usual breakfast dishes, The Paw Paw Café definitely delivers. They also make great coffee and this can be collected from the takeaway window which faces Potts Street. You'll think you've died and gone to heaven with the Israeli Breakfast. For those on the Northside, the Little Pawpaw has opened up in Kedron, and is the younger and smaller sibling, brought to you by the same team as the Paw Paw café. I'm yet to try the Little Pawpaw, but if the food is anywhere as good as the Paw Paw, I will definitely head on to Kedron! So there you have it, 5 (in my humble opinion) of the best cafes in Woolloongabba – if you are a southside local or even from the north, do yourself a favour and give these a try. They are definitely some of the best I've been to on my morning pursuit of quality coffee and good food. 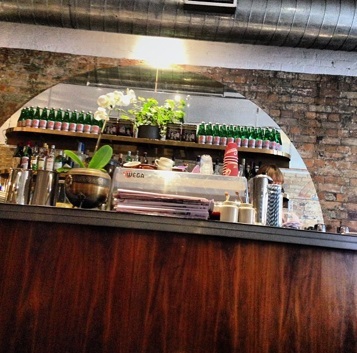 Do you agree with these as the 5 best Cafes in Woolloongabba? Are there any others that should have made the list? Let everyone know with a comment and your recommendation. Don't forget brown dog on Logan road. 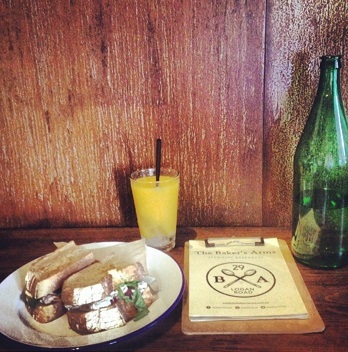 Great article, covers most of the hot spots in East Brisbane with still a few other spots to be discovered! Thanks.. Will try the others... Best bagel ever to be bought at Bakers Arms.. ( the Montreal Bagel). But what about BearTown? It is across the road near Coles.. The staff warm, friendly and the food is always good..